Herbert enlisted on 28th May 1915. He was 30 years and 11 months old, and was a calico sorter/storekeeper at a local print works by trade (according to the 1911 Census). He joined the R.A.M.C. at Sheffield Warncliffe War Hospital where he qualified as a nursing orderly. On the 16th June 1917 he was posted to the R.A.M.C. Depot, Blackpool where it appears he served with No. 8 Coy. On the 11th September 1917 he embarked at Devonport on the RMS Orontes, then transferred to H. T. Umtata in Durban and disembarked at Dar es Salaam in Tanganyika (now Tanzania) five days later. From there he was posted to the 37th Stationary Hospital, based at Morogoro also in Tanganyika. He served for the remainder of the war with the 37th Stationary Hospital, until 26th April 1918, when the Unit embarked on H. T. Salamis at Dar es Salaam and proceeded to Mozambique. On the 5th November 1918 they disembarked from H. T. Hong Moh back at Dar es Salaam and five days later, on the 10th November 1918, proceeded to Tabora again in Tanganyika. On the 30th January 1919 the Unit embarked on H.M.H.S. Gascon at Dar es Salaam and returned to the UK on ‘transfer to Home Establishment’. 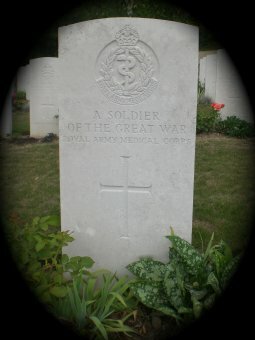 Herbert was discharged on the 17th April 1919 but died only one month later at home. He was the husband of Elizabeth Dean (nee Cowper) of 84 Stanley Street, Accrington. They married on the 4th May 1907 and had a daughter Margaret Ann (b. 19th Jan 1912). [Information researched and kindly provided by Chris Ludlam] and joined the RAMC at Sheffield Warncliffe War Hospital where he qualified as a nursing orderly.